As part of our commitment to providing the Aboriginal and Torres Strait Islander community of Brisbane with a comprehensive range of primary health care, youth, child safety, mental health, dental and aged care services, we employ approximately 150 people across our locations at Woolloongabba, Woodridge, Northgate, Acacia Ridge, Browns Plains, Eagleby and East Brisbane. Working collaboratively with the CEO, in this position you will provide strong internal leadership and day-to-day management to Corporate Services enabling Danila Dilba Health Service to achieve its strategic and operational goals. The position actively engages and liaises with internal and external stakeholders, effectively communicating the organisation’s vision and strategies. You will lead an advocacy agenda for Danila Dilba to influence decision makers on policy issues related to Aboriginal health and wellbeing. You will have demonstrated strategic leadership and planning skills, with strengths in business development and advocacy. You will possess a strong understanding of Aboriginal and Torres Strait Islander history, culture and aspirations and the role of community controlled health organisations. 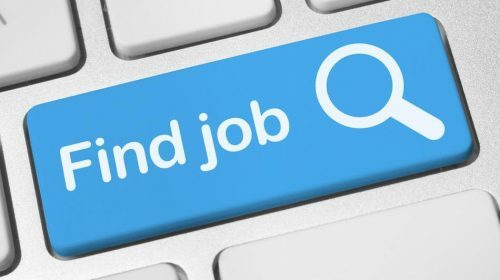 You will be a creative communicator with Knowledge of State/Territory and Federal Government agencies and funding arrangements and proven experience in managing funded programs. 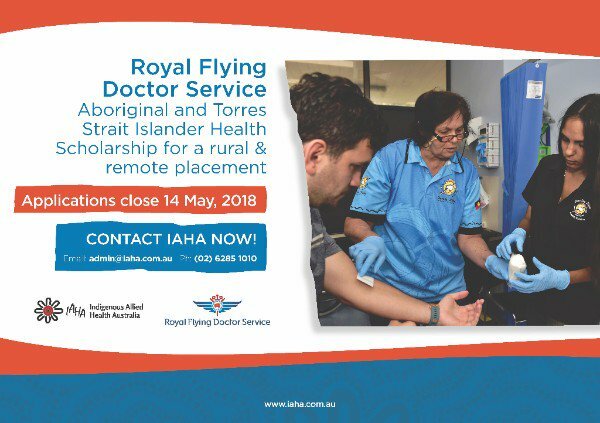 Applications are open for Round 1 of the IAHA RFDS Aboriginal and Torres Strait Islander Health Scholarship, which aims to support Aboriginal and/or Torres Strait Islander allied health students to undertake a remote/rural clinical placement. Applications for Milparanga – developing Aboriginal and Torres Strait Islander Leadership. Milparanga is a leadership development program and was formerly known as the National Aboriginal and Torres Strait Islander Leaders Program (NATSILP). It is an 11-day, two session program, with the first session taking place in a regional location and the second session taking place in Canberra. Milparanga is for Aboriginal and/or Torres Strait Islander person who are 21 years or older. There are full scholarships available (Australian Government), as well as placements for those who obtain their own funding. The cost of Milparanga is $12,500 plus GST. This includes all accommodation, meals, on course travel, and equipment. Participants may be responsible for a small component of their travel to and from major transport services. The participant contribution is $200 plus GST towards program costs and for lifetime membership of the Network of Fellows of the Australian Rural Leadership Foundation. They may also be responsible for a small component of their travel to and from major transport services. Applications for the Ngurra-Jarraddjak Indigenous Graduate Study Options Program are now open. This exciting program will be hosted by the Faculty Medicine, Dentistry & Health Sciences (MDHS) at the University of Melbourne and is open to 1st and 2nd year Indigenous undergraduate students who are interested in pursuing graduate studies in health sciences. The week-long residential program will give students exposure to different health research institutions, meet Indigenous health professionals, discover pathways into different health careers and the opportunity to meet faculty staff and alumni. The program envisages the knowledge given to the students during the week will increase graduate enrolments down the track. Applications are open now and will close on Sunday April 22. Places in this program are strictly limited, so get in early as it’s an opportunity not to be missed! No 2 : The American Australian Association is introducing The AAA-Lisa Fox Indigenous Scholarship and AAA-Aurora Indigenous Scholarship to support Australian indigenous students to undertake full time post graduate research and study in any disciplinary field in the United States. We would be grateful if you could help us spread the word about the scholarship program within your organization and encourage applicants. 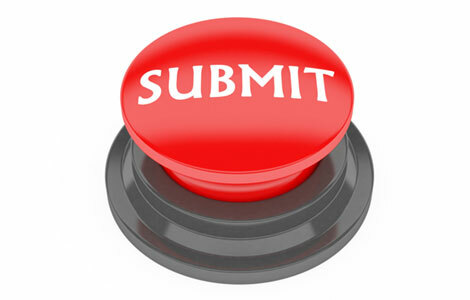 The scholarship awards are up to US$40,000 and are open till April 15th. Applications for the scholarship are available here. We will be happy to answer any questions you may have and assist applicants through the application process. The Department of Health would like to invite all eligible Aboriginal and Torres Strait Islander people looking for a career in the Australian Public Service to apply in their Graduate Development Program Affirmative Measures (Indigenous) recruitment process. Applications close on Monday 16 April 2018. The Department of Health recognises and values the diverse and extensive knowledge and skills and experiences that Aboriginal and Torres Strait Islander employees bring and commit to increasing opportunities for professional and personal development. The Department’s vision is to build a culturally safe and aware workplace environment that is built on mutually respectful relationships and appreciation. Greater cultural understanding within the Department will ensure we are appropriately delivering effective health policies and programs for Aboriginal and Torres Strait Islander peoples nationally. We also seek to celebrate the importance of identity, community and shared knowledge in Aboriginal and Torres Strait Islander culture, values and life. We recognise and value the diverse and extensive knowledge and skills and experiences that Aboriginal and Torres Strait Islander employees bring to Health and commit to increasing opportunities for professional and personal development. The Department has an in-house Cultural Appreciation Program (CAP) which is designed to give employees a greater appreciation of Aboriginal and Torres Strait Islanders culture, customs and traditions as well as providing tools and techniques to communicate and engage effectively with Aboriginal and Torres Strait Islander people. Our 2017-19 Innovate Reconciliation Action Plan (RAP) will continue to help us contribute towards a reconciled Australia, in which all Australians understand and value the cultures, experiences and rights of Aboriginal and Torres Strait Islander peoples. Reconciliation is an ongoing endeavour, and all Health employees have an important role to play in advocating and delivering on all outcomes in the RAP. The Department’s National Aboriginal and Torres Strait Islander Staff Network (NATSISN) is an informal peer network, run by employees who identify as Aboriginal and Torres Strait Islander staff members. It aims to welcome, orient and support new and existing Aboriginal and Torres Strait Islander staff. The NATSISN is also an informal resource for all Health staff to seek information on Aboriginal and Torres Strait Islander issues. NATSISN also has an affiliate membership called Friends of the Network which is an opportunity for non-Indigenous staff to show their commitment to reconciliation, and to learn about Aboriginal and Torres Strait Islander cultures and communities. The NATSISN is supported by Senior Executive Champions who provide support to the Aboriginal and Torres Strait Islander workforce, the NATSISN and its initiatives, and contribute to celebrating and recognising Aboriginal and Torres Strait Islander cultures in the Department. 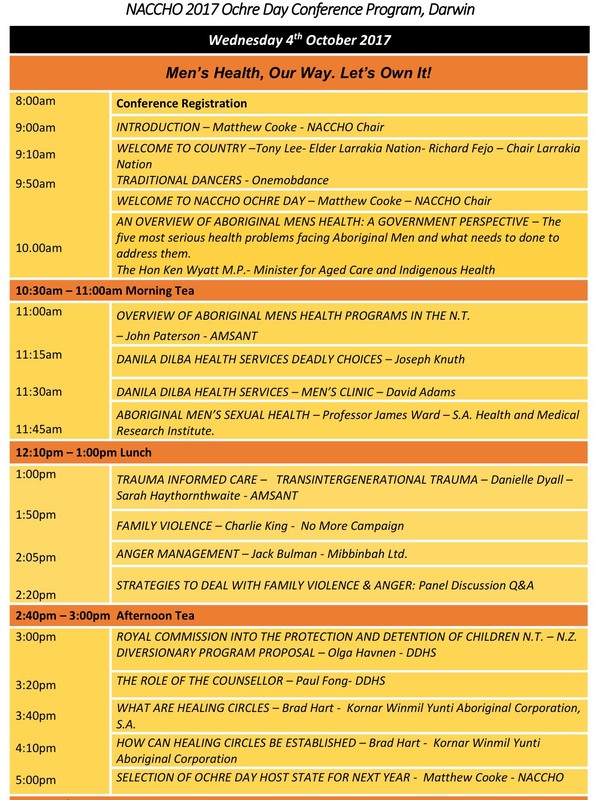 Aboriginal Male Healthy Futures 2013-2030 Register Now #OchreDay2017 Darwin 4-5 Oct: How can we increase positive outcomes for our mob ? 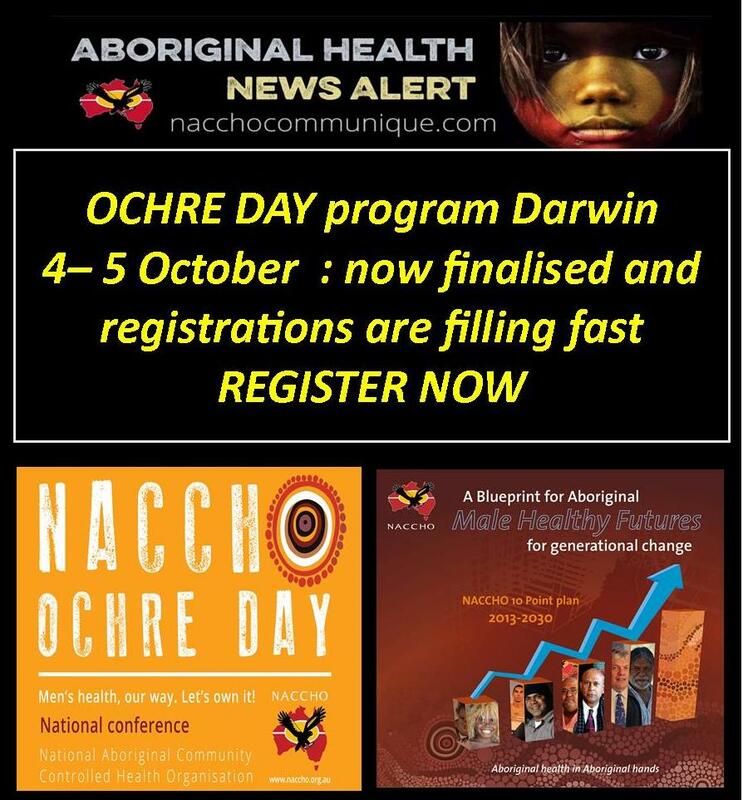 ” NACCHO has long recognised the importance of an Aboriginal male health policy and program to close the gap by 2030 on the alarming Aboriginal male mortality rates across Australia. 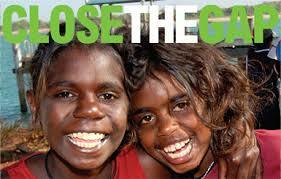 Aboriginal males have arguably the worst health outcomes of any population group in Australia. John Paterson – Amsant – Overview of Aboriginal Mens Health Programs in the N.T. 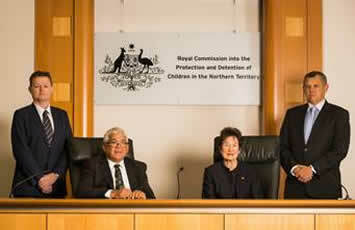 Nick Espie- Royal Commission into the Protection and Detention of Children N.T. NACCHO, its affiliates and members are committed to building upon past innovations and we require targeted actions and investments to implement a wide range of Aboriginal male health and wellbeing programs and strategies. 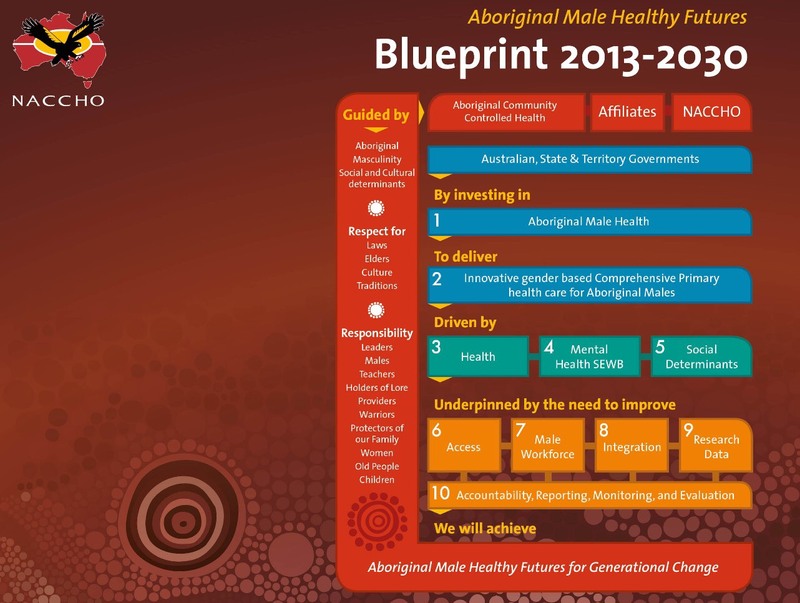 This blueprint as set below highlighted how the Aboriginal Community Controlled Health Services sector could continue to improve our rates of access to health and wellbeing services by Aboriginal males through working closely within our communities, strengthening cultural safety and further building upon our current Aboriginal male health workforce and leadership. These solutions have been developed in response to the deep-rooted social, political and economic conditions that effect Aboriginal males and the need to be addressed alongside the delivery of essential health care. Our plan is based on evidence, targeted to need and capable of addressing the existing inequalities in Aboriginal male health services, with the aim of achieving equality of health status and life expectancy between Aboriginal males and non-Aboriginal males by 2030. 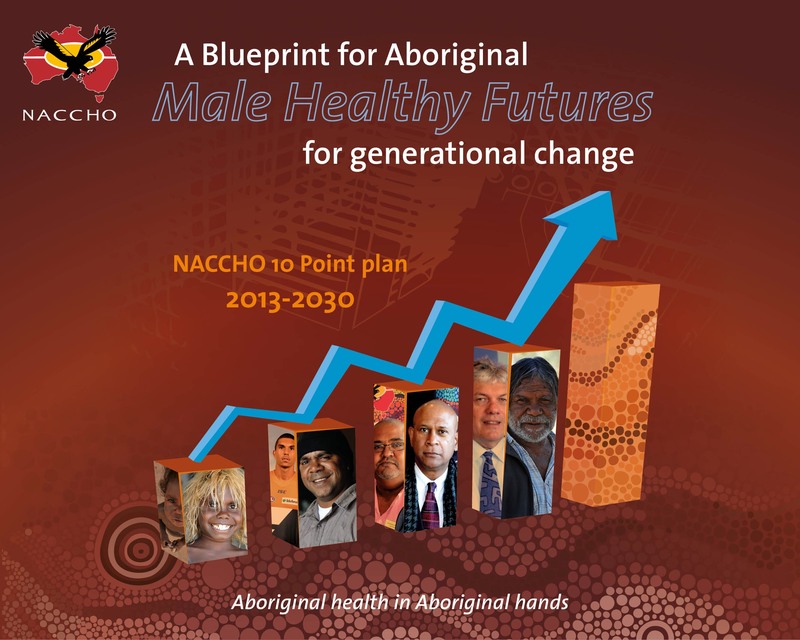 NACCHO, our affiliates and members remain focused on creating a healthy future for generational change and the NACCHO Aboriginal Male Health 10 point Blueprint 2013-2030 will enable comprehensive and long-term action to achieve real outcomes. 3. To ensure Aboriginal males have equal access to health services that are equal in standard to those enjoyed by other Australians, and ensure primary health care services and health infrastructure for Aboriginal males are capable of bridging the gap in health standards by 2030. 4. To prioritise specific funding to address mental health, social and emotional well-being and suicide prevention for Aboriginal males. 5. To ensure that we address Social determinants relating to identity culture, language and land, as well as violence, alcohol, employment and education. 7.To provide an adequate workforce to meet Aboriginal male health needs by increasing the recruitment, retention, effectiveness and training of male health practitioners working within Aboriginal settings and by building the capacity of the Aboriginal and Torres Strait Islander health workforce. 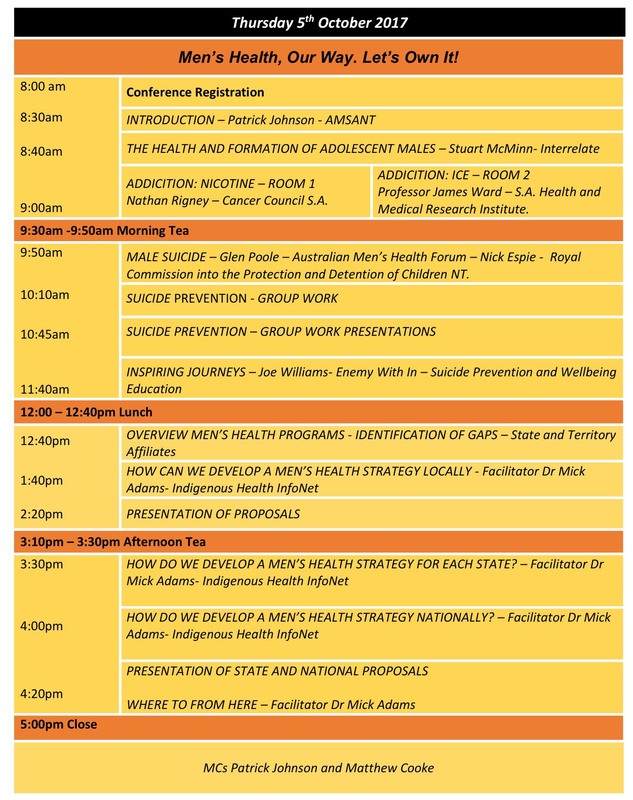 8 To identified and prioritised (as appropriate) in all health strategies developed for Aboriginal Community Controlled Health Services (ACCHSs) including that all relevant programs being progressed in these services will be expected to ensure Aboriginal male health is considered in the planning phase or as the program progresses. 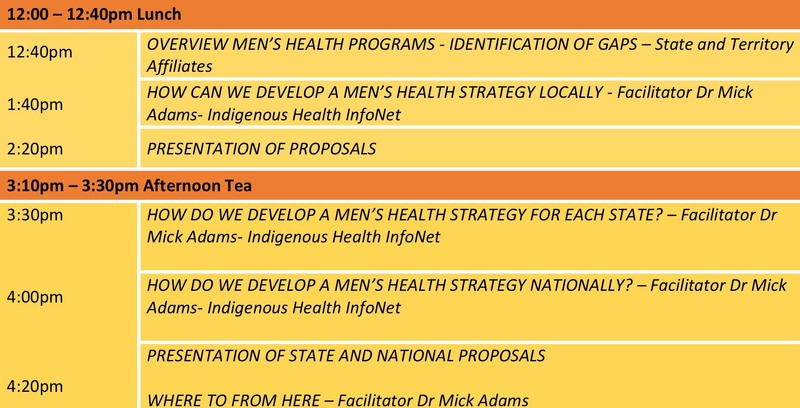 Specialised Aboriginal male health programs and targeted interventions should be developed to address male health intervention points across the life cycle continuum. 9. To build on the evidence base of what works in Aboriginal health, supporting it with research and data on relevant local and international experience and to ensure that the quality of data quality in all jurisdictions meets AIHW standards. 10. To measure, monitor, and report on our joint efforts in accordance with benchmarks and targets – to ensure that we are progressively reaching our shared aims. NOTE 2013 : 1.Throughout this document the word Male is used instead of Men. At the inaugural Aboriginal and Torres Strait Islander Male Health Gathering-Alice Springs 1999, all delegates present agreed that the word Male would be used instead of the word Men. With the intention being to encompass the Male existence from it’s beginnings in the womb until death. 2.Throughout this document the word Aboriginal is used instead of Aboriginal and Torres Strait Islander. This is in line with the National Aboriginal Community Controlled Health Organisation (NACCHO) being representative of Aboriginal People. This does not intend to exclude nor be disrespectful to our Brothers from the Torres Strait Islands. “We think it’s also been really important to try to dispel the public perception that somehow spending more money in Aboriginal health isn’t a worthwhile or a viable thing to do. The comments come after a report by the Productivity Commission found Indigenous Australians are becoming more disadvantaged, citing alarming increases in imprisonment rates, mental health problems and rates of self-harm. The report also said of the $30 billion budget allocated to overcoming these disadvantages, just 34 of the 1,000 federally funded programs had been properly evaluated. 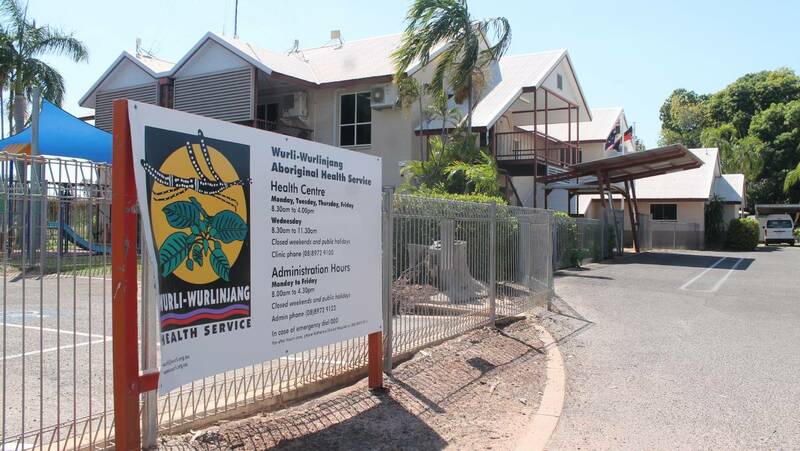 Northern Territory Aboriginal health service Danila Dilba has engaged a private economics consultancy firm to carry out a cost/benefit analysis of its key primary health care services, CEO Olga Havnen said. “For every $1 invested we’re delivering a $4.18 return,” she said. But the report also showed Danila Dilba’s outcomes were not the norm. Indigenous leaders said the lack of economic evaluation left billions of dollars being spent in areas that may not have been proven effective. “As a taxpayer you should be concerned that programs for which there is no evidence are being funded,” anthropologist Marcia Langton told the National Press Club. The head of the Prime Minister’s Indigenous Advisory Council, Warren Mundine, said measurable data offered guidance for funding targets. “It should be clear that you don’t get funding forever just for the sake of funding, you actually have to get clear outcomes, and outcomes that are successful,” he said. There should be a real evaluation program in place if the federal government is “handing out taxpayers’ money”. “We’ve got to totally revamp the way the evaluations are done and make them real so we get measurable data — and we can do that tomorrow morning,” Mr Mundine said. A spokesperson for Federal Indigenous Affairs Minister Nigel Scullion admitted there was a need for more evidence to demonstrate which programs were working. “Minister Scullion acknowledged that in the areas of incarceration, domestic violence, mental health and substance misuse, increased effort was required to improve outcomes — and better evidence was needed to drive this progress,” the spokesman said in a statement. Public sector governance expert Steven Bartos said allocating funds without evidence created a false economy. “When you don’t know anything about any of the programs then you’re just relying on gut feelings, and that’s not good enough,” he said. 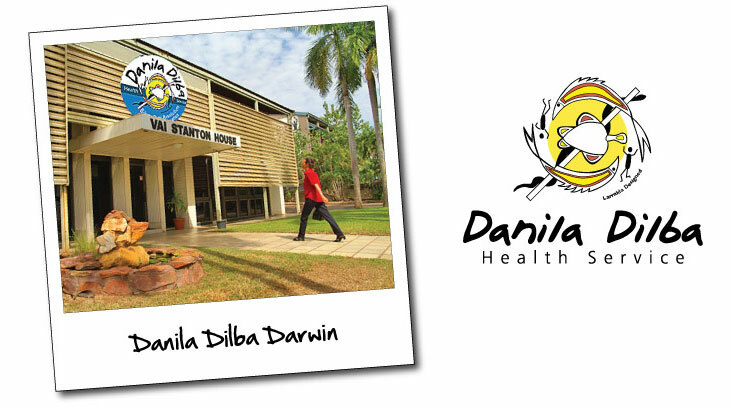 The 8th of November, 1991 was a day of great pride for Darwin’s Aboriginal community with the official opening of Danila Dilba Health Service. Its beginnings as an Aboriginal community controlled health organisation go back to the 1970s — a time of great activism for Indigenous people across Australia. After Cyclone Tracy hit in 1974, Darwin people were evacuated to southern cities where local Aboriginal medical services had started. People from the local Aboriginal community were impressed with the services and wanted their own one. Danila Dilba grew out of the community, with people holding meetings, lobbying government, lodging petitions and even holding a ‘sit-in’ at government offices for a culturally appropriate primary health service for Indigenous people. The name Danila Dilba Biluru Butji Binnilutlum was given to the service by the local Larrakia traditional custodians. In the Larrakia language Danila Dilba means ‘dilly bag used to collect bush medicines’ and Biluru Butji Binnilutlum means ‘Aboriginal people getting better from sickness’. Our logo reflects this meaning and was designed by Larrakia elder, the Reverend Wally Fejo. The service was friendly, comfortable and provided holistic care. Danila Dilba was a safe place for Indigenous people to raise their concerns and find solutions to their health concerns. Danila Dilba has grown significantly in size and capacity, from eight staff and one building in 1991 to five clinics, including separate men’s and women’s clinics, mobile and dental clinics, community programs and a staff of over 130 serving almost 12,000 clients in 2016. Our Aboriginal Health Practitioner First policy, where new clients see an AHP before a GP, and our large Indigenous staff are the core of our culturally appropriate care. NACCHO #NTRC Aboriginal Health : Two NT #ACCHO ‘s funded for support services for people impacted by the Commission. ” The Commonwealth Department of Social Services has announced that funding has been provided for support services for children, young people, their families and others impacted by the Commission. The Commission confirms that tomorrow’s proposed community in Hermannsburg (20 October 2016) has been cancelled due to other business in the community. mentoring by Aboriginal and Torres Strait Islander cultural advisors, and healing camps on Country. Hearing and talking about child protection and kids in detention can be hard for young people, parents, families and communities. This emotive aphorism by Pearson embodies the struggle of Australia’s Indigenous people to gain control of their destiny, which for generations has been wrested from them into the power of governments. Although his statement was primarily directed toward welfare, the same right of responsibility can be applied to health, perhaps the gravest challenge facing the Aboriginal population. As Pearson alluded to, the only way to solve the health crisis is by enabling local communities to take charge of their own affairs. This principle of self-determination has led to the creation of Aboriginal Community Controlled Health Services (ACCHS), which has allowed over 150 Aboriginal communities throughout Australia control over their healthcare. This article describes the founding principles behind community controlled health centres in Aboriginal communities through considering several different ACCHS and the unique challenges they face. The fundamental concept behind each ACCHS – whether metropolitan, rural or remote – is the establishment of a primary healthcare facility that is both built and run by the local Aboriginal people “to deliver holistic, comprehensive, and culturally appropriate health care to the community which controls it.”  This is based upon the principle of self-determination and grants local people the power to achieve their own goals. From the beginning ACCHS were always intended to be more than exclusively a healthcare centre and each ACCHS has four key roles: the provision of primary clinical care, community support, special needs programmes, and advocacy. This principle is espoused in the National Aboriginal Health Strategy’s frequently quoted statement that “Aboriginal health is not just the physical well-being of an individual but the social, emotional and cultural well-being of the whole community in which each individual is able to achieve their full potential thereby bringing about the total well-being of their community.”  The notion of ‘community’ is an essential component of the Indigenous view of the self and therefore strongly related to health and well-being. Accordingly, ACCHS have a holistic view of healthcare, recognising that Indigenous healthcare needs to be multi-faceted and focus on cultural complexities that may not be appreciated by mainstream health services. As each Aboriginal community across the country has a distinct culture and language,  local control is paramount. Specialised Indigenous policies are essential, as it is impossible to apply the same approach that is used in health services for non-Indigenous patients. Many Indigenous people are uncomfortable with seeking medical help at hospitals or general practices and therefore are reluctant to obtain essential care. In addition, access to healthcare is often extremely difficult due to either geographical isolation or lack of transportation. Many Indigenous people live below the poverty line, so the services provided by practices that do not bulk bill are unattainable. Mainstream services struggle to provide appropriate healthcare to Aboriginal patients due to significant cultural and language disparities; [5,13] the establishment of ACCHS attempts to overcome such challenges. Nevertheless, the consequence of longstanding obstacles to Indigenous access to mainstream healthcare is manifest in the stark inequity between the health outcomes of Indigenous and non-Indigenous Australians. The most recent data from the Australian Institute of Health and Welfare (AIHW) shows that the discrepancy in life expectancy between Aboriginal Australians and their non-Indigenous counterparts remains unacceptably high, at 11.5 years for males and 9.7 for females. Moreover, studies demonstrate that Aboriginal people have significantly worse outcomes in key health indicators, including infant mortality, diabetes, heart disease, infectious disease and mental illness. [5,12,13,16] Such disparities indicate that a novel, tailored approach to Indigenous health is required. Cultural understanding is essential, as demonstrated by the example of the Anyinginyi Health Aboriginal Corporation in the Northern Territory. Anyinginyi serves the twelve remote Aboriginal communities within a 100km radius of Tennant Creek and its name comes from the local Warumungu language, meaning ‘belonging to us’  emphasising the community’s control of, and pride in, this service. Anyinginyi has always strived to be more than just a health service and has evolved to deliver many other community programmes. This is embodied by Anyinginyi’s insistence on ‘culturally appropriate’ healthcare for Aboriginal people. In addition to medical advice, the local Aboriginal community is offered support through various programmes that range from employment services to cultural and spiritual activities promoting Indigenous language and culture. One such social service is the ‘Piliyintinji-Ki Stronger Families’ initiative, which assists community members through access to support services relating to issues such as family violence and the Stolen Generations. Indeed, ACCHS such as Anyinginyi have the additional benefit of providing employment opportunities for community members, as the vast majority of the employees are Indigenous. All new staff members participate in a Cross Cultural Workshop, as one of Anyinginyi’s goals is to ensure that the local Aboriginal cultures are respected and continue to thrive. The other important arm of healthcare in ACCHS relates to population health, with initiatives ranging from education campaigns to immunisations and screening for diseases. One of the first large-scale community health promotion campaigns run specifically for Aboriginal people was conducted by the Redfern AMS between 1983-1984 to encourage breast-feeding among the local Koori mothers. It achieved such stunning success that it set a precedent for all future ACCHS to continue in the important area of preventative medicine, with similar campaigns for sexual health and safe alcohol consumption having been undertaken subsequently. Moreover, each ACCHS runs special services that are dictated by local needs and priorities. In some instances, there is a specific health problem that needs to be addressed, such as poor nutrition or substance abuse. Other programmes are directed at specific groups, such as young mothers or the elderly. The flexibility of these special services allows each ACCHS to identify and address the most significant problems within its area – problems that can only be identified by the community itself. For example, the Danila Dilba Health Service in Darwin runs a programme called ‘Dare to Dream’ that provides support and counselling for young Indigenous people suffering from mental illness. It is an early intervention programme that intends to identify and support adolescents exhibiting early signs of both behavioural and mental health problems. To this end, school visits are undertaken to promote awareness of mental health issues to students and staff, as well as the services that Danila Dilba has to offer. A ‘chillout’ centre has been set up in Darwin as a safe place for young people to come and allows the community workers to refer those who present to appropriate counselling services. As such, Danila Dilba is empowered to proactively address an important local issue in the most culturally-appropriate way. ACCHS are also active in the area of advocacy. This involves providing a voice for the community so that their needs can be expressed. Although each ACCHS operates autonomously, they form a national network with their collective interests represented both on a state/territory level and also nationally. Each of the eight states and territories has a peak representative body that acts on behalf of all ACCHS within that jurisdiction. Examples of these organisations include the Aboriginal Health & Medical Research Council of New South Wales and the Aboriginal Medical Services Alliance Northern Territory. 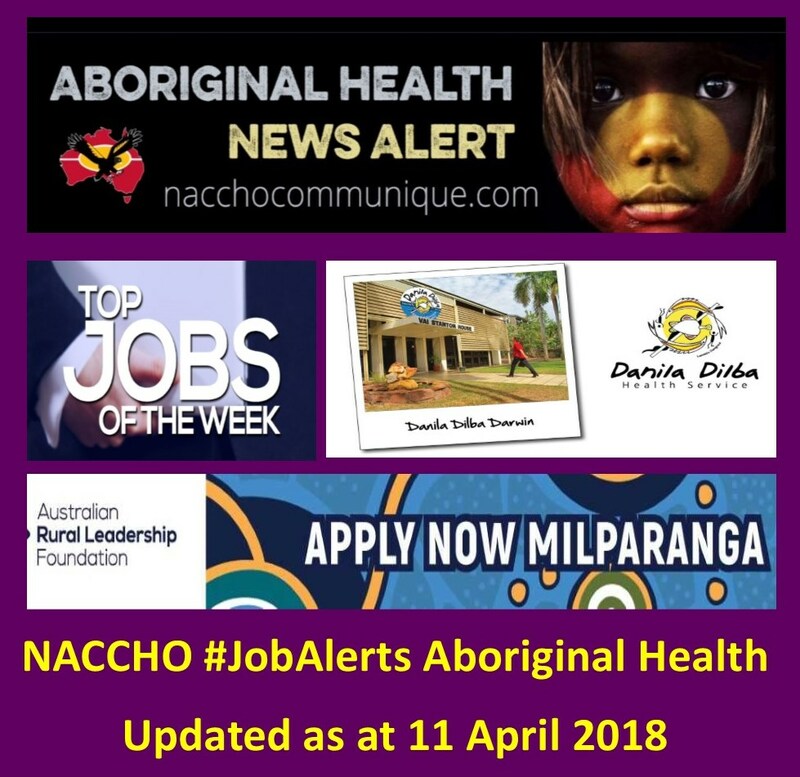 At the national level the umbrella body overseeing all the different stakeholders across the country is the National Aboriginal Community Controlled Health Organisation (NACCHO). Individual ACCHS, as well as NACCHO and the affiliated state or territory peak bodies, lobby all levels of government for increased funding and greater recognition of the issues facing Aboriginal communities. The collective weight of NACCHO as a national advocate allows each community’s needs to be heard. Inevitably, the scope of the services each ACCHS can provide is restricted by funding, most of which comes from the Commonwealth or State and Territory Governments. More money continues to be spent per capita on mainstream health services than on Aboriginal health, despite the great dichotomy in health outcomes. Indeed, the 2012 Indigenous Expenditure Report published figures showing that for every dollar spent on healthcare subsidies for non-Indigenous health, only $0.66 is spent on Aboriginal health. This statistic covers all the key areas of healthcare expenditure, such as Medicare rebates, the pharmaceutical benefits scheme (PBS) and private health insurance rebates. Therefore, Indigenous patients are not receiving the same level of health service delivery, including clinical consultations and treatment, compared to their non-Indigenous counterparts. However, it is propitious to note that the funding bodies have recognised the value of the public health efforts of ACCHS, as the spending in this area is a $4.89 to $1.00 ratio in favour of Indigenous health. Nevertheless, the priority needs to be placed on ensuring that sufficient funding exists to allow Indigenous patients to access health care subsidies as required. Services become stretched due to perpetual resource inadequacies. Understandably, the remoteness of some communities makes service delivery challenging, yet even major metropolitan areas with large Indigenous populations can struggle to adequately provide for those in their catchment area. Under-resourcing places major constraints on service delivery and different ACCHS throughout the country exhibit significant variation in the level of services offered. Some are large, employ several doctors and provide a wide range of services; others are much smaller and operate without doctors. These rely on Aboriginal health workers and nurses to provide the bulk of primary healthcare. As such, the success of the ACCHS concept would not have been possible without the contribution of Aboriginal health workers. The role of Aboriginal health workers, who are often sourced from the local community, is to provide the primary healthcare that ACCHS offer. This involves assessing patients and then coordinating or providing the medical attention required. Health workers are able to treat certain conditions with the help of standard treatment guidelines and provide a selection of important medications to patients. Importantly, Aboriginal health workers have a liaison role between medical professionals and Aboriginal patients. They are often required to act as an interpreter between the patient and health professional, thus providing an intermediary for cross-cultural interactions, and therefore improving the quality of healthcare provided to the local community. Due to the often quite remote locations of ACCHS and the scarcity of doctors and nurses, Aboriginal health workers perform many clinical tasks that would be provided by a medical professional in mainstream health services. Aboriginal health workers bear much greater responsibility than their colleagues in the public sector and often learn a wide range of procedural skills including how to perform standard health checks, vaccinations and venepuncture. Indeed, some choose to specialise in a specific area (such as diabetes, pregnancy or infant care) thus gaining additional skills and responsibilities. Still others take on managerial responsibilities. This is in contrast to the public sector, where health workers are often fixed to one routine area or even to non-clinical work such as transportation or social assistance. Without Aboriginal health workers performing these additional tasks, ACCHS would not be able to provide a sufficient level of service for the community. For this reason, Aboriginal health workers are rightly considered the backbone of community controlled health services. As one example, the Pika Wiya Health Service in the South Australian town of Port Augusta runs two outreach clinics for communities in Copely and Nepabunna. Due to the shortage of doctors, these clinics are staffed entirely by Aboriginal health workers. Their invaluable contribution is evident, with 695 clinical encounters performed by health workers during 2008,  ensuring that the absence of doctors did not deny the local people the chance to receive healthcare. Whilst the major health issues faced by Indigenous people are broadly similar between urban and remote communities, these problems are often compounded by the remoteness of the location. Although these are challenges that Copely and Nepabunna will continue to have to face, the empowerment of Aboriginal health workers has helped redefine the direction of Pika Wiya’s outreach health services. Aboriginal health workers face many difficulties. Perhaps the most significant is that, until recently, there had been no national qualifications or recognition of the skills they developed. The introduction of national registration for Aboriginal health workers (from July 1 2012) and the new qualification of Certificate IV in Aboriginal and Torres Strait Islander Primary Health Care (Practice) have revolutionised the industry. This has had the benefit of standardising the quality and safety of the Aboriginal health worker labour force. However, as the changes will increase the required length and standard of training, there is the potential for current or prospective health workers to be deterred by the prospect of undertaking study at a tertiary level, particularly if they have had limited previous education. Nevertheless, national registration is a positive step for recognising the important work done by Aboriginal health workers, and in providing them with the training to continue serving their communities. In addition to doctors, nurses and health workers, medical students are also important stakeholders in Indigenous health. First, much has been done in recent years to increase the numbers of Indigenous medical students. For example, the University of Newcastle has been the first medical school to make a dedicated attempt at training Indigenous doctors and has produced approximately 60% of Australia’s Indigenous medical practitioners. This achievement has been based on a “strong focus on community, equity and engagement by the medical profession.”  Encouraging community members to enter the profession can be an important way of addressing both the lack of doctors in Indigenous communities and paucity of doctors of Indigenous background. The benefits are broader than this, as Indigenous doctors provide strong role models for young Indigenous people and also have the opportunity to contribute with advocacy and leadership within Indigenous health. Secondly, the medical student population as a whole is exposed to increasingly more Indigenous health as part of the core curriculum at university following adoption of the updated Australian Medical Council accreditation standards from 2007. Additionally, some students even have the opportunity to spend time in an ACCHS and experience first-hand how the system works. There has been some criticism of these ‘fly in, fly out’ medical electives, where students are sent to ACCHS for short periods and then leave. Whilst this model may be beneficial for the student, it fails to engage the local community as they are unable to build meaningful or lasting relationships with the student. Better models allow for a longer-term placement and immersion in the community. These include the John Flynn Placement Programme where some students are able to spend a fortnight annually in an ACCHS in the Northern Territory over a period of four years. Another example is the Northern Territory Clinical School, which allows third-year medical students from Flinders University to spend a whole year of study in Darwin, providing the opportunity for increased contact with local Indigenous communities. Initiatives such as these help to build a relationship with the community, and allows for increased acceptance of the medical student. Additionally, the student is able to make a more meaningful contribution to various client’s healthcare. Prolonged or longitudinal attachments have also been shown to increase the likelihood of students returning as a doctor. Certainly, there is much scope for the contribution of medical students to be harnessed more effectively. It is abundantly apparent that any solution to address the health inequalities of Aboriginal people will only be effective if it recognises that the local Aboriginal communities must control the process of healthcare delivery. This is the principle upon which ACCHS were founded and can be attributed to their many successes, as demonstrated through the examples of Redfern’s AMS, Inala, Anyinginyi, Danila Dilba and Pika Wiya. In spite of the challenges posed by inadequate funding, under-staffing and often remote locations, these organisations strive to uphold the ideals of self-determination and community control. It is hoped that wider adoption of these principles by national governing bodies together with improved financial support will enable Indigenous Australians control over their lives and destinies, leading to better health outcomes. NACCHO health news:Healing the Fault Lines: uniting politicians, bureaucrats and NGOs for improved outcomes in Aboriginal Health. Prominent Aboriginal Territorian and the current CEO of Danila Dilba Health Service Olga Havnen argues that the “fault lines” between politicians, bureaucrats and NGOs and the Aboriginal Community Controlled Health sector must unite to make a real difference. A little known positive aspect of the Northern Territory Intervention was a significant increase in resources to Aboriginal Comprehensive Primary Health Care. This, along with parallel initiatives under Closing the Gap, gave some hope that the decades long demands from our sector for substantial extra resources in primary health care was at last being heard. However, while we have been making some advances in the Northern Territory, we face the potential for a “race to the bottom” in Aboriginal health where the interests of politicians, bureaucrats and NGOs potentially outweigh the evidence of Aboriginal community control. Prominent Aboriginal Territorian and the current CEO of Danila Dilba Health Service Olga Havnen argues that the “fault lines” between these groups and the Aboriginal Community Controlled Health sector must unite to make a real difference. 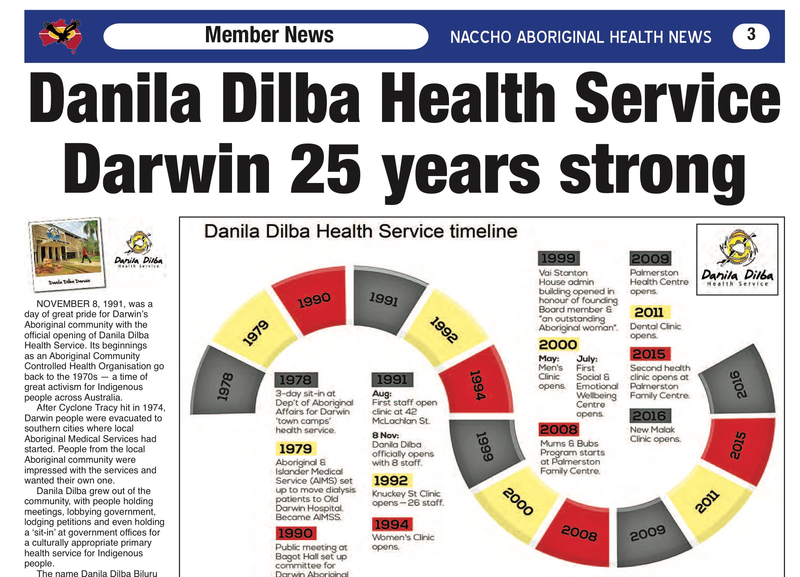 I am currently the CEO of Danila Dilba Health Service in Darwin, which has not long ago celebrated its 20th anniversary. We are an Aboriginal Community Controlled Health Service—and part of a broader, national movement of community controlled comprehensive primary health care that has its origins in Redfern some 42 years ago. At the core of what we have achieved over those many years has been an aggressive approach to basing our work on evidence. Our accumulated achievements have always been based on what works—in clinical as well as social practice. At the heart of what we have strived to achieve is the development of a practice—both clinical and social—that displays our strong and central commitment to comprehensive primary health care. Primary health care is essential health care based on practical, scientifically sound and socially acceptable methods and technology made universally accessible to individuals and families in the community through their full participation and at a cost that the community and country can afford to maintain at every stage of their development in the spirit of self-reliance and self-determination. Primary health care is socially and culturally appropriate, universally accessible, scientifically sound, first level care. REMOTE indigenous communities are suffering from a government culture of “risk intolerance” which has diverted funding from community-led organisations, a leading Aboriginal figure has said. Olga Havnen, the Northern Territory’s former co-ordinator general for remote services, last night attacked successive governments for choosing large non-government organisations for service delivery ahead of smaller indigenous-led organisations. Ms Havnen said many community-led service delivery organisations had “disappeared” since the Northern Territory Emergency Response in 2007. “Aboriginal control of service delivery in many areas has withered on the vine,” she said in the Lowitja O’Donoghue Oration at the University of Adelaide. 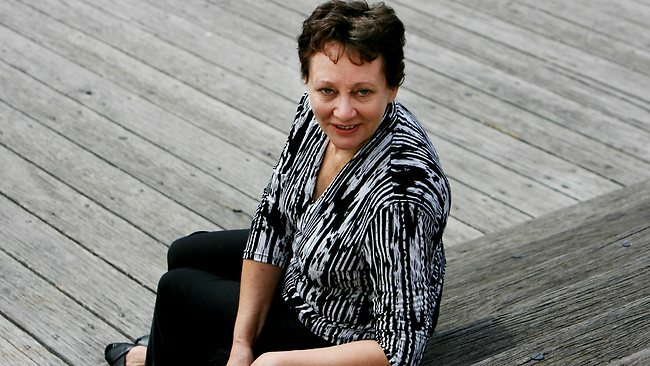 Ms Havnen, whose position in the Territory was abolished by the new Country Liberal Party government in October, said there had been a “massive expansion” of NGO involvement in service delivery with “many millions of dollars” flowing to non-indigenous NGOs and multinational NGOs, regardless of their effectiveness. She said in the past decade, only one new community controlled health service had been established in the Territory and only two remote health clinics handed across to community control. “It is a process which has allowed government agencies to quarantine themselves from what they too often ascribe as risk in funding Aboriginal organisations,” she said. Ms Havnen, who is now chief executive of the Danila Dilba Health Service in Darwin, an Aboriginal community controlled health service, said that there needed to be a fundamental change in the relationship between Aboriginal service delivery in the Territory and elsewhere, and politicians, bureaucrats and NGOs who were involved in the process. “The politicians and public servants can be agents of innovation and change if they abandon risk intolerance,” she said. “Similarly, the response of NGOs to the last decade or so of reaping the benefits of government funding into Aboriginal service delivery must also change. Ms Havnen said she remained concerned about many elements of the 2007 intervention into Northern Territory communities, which would continue to have a psychological impact “for many years”. The dedication and leadership of Northern Territory health professionals working in the field of chronic diseases has been celebrated in Darwin this evening. Minister for Health David Tollner hosted the Chronic Diseases Network Recognition Awards, one of the highlights of the 16th Annual Chronic Diseases Network Conference, which opened today. “The Chronic Diseases Network Recognition Awards are an opportunity to identify and celebrate the innovation, leadership and achievements of the Northern Territory’s chronic diseases health professionals,” Mr Tollner said. “Individuals, teams and organisations from across the Territory have been nominated by their peers, colleagues and clients for their contributions to tackling chronic diseases in the NT. 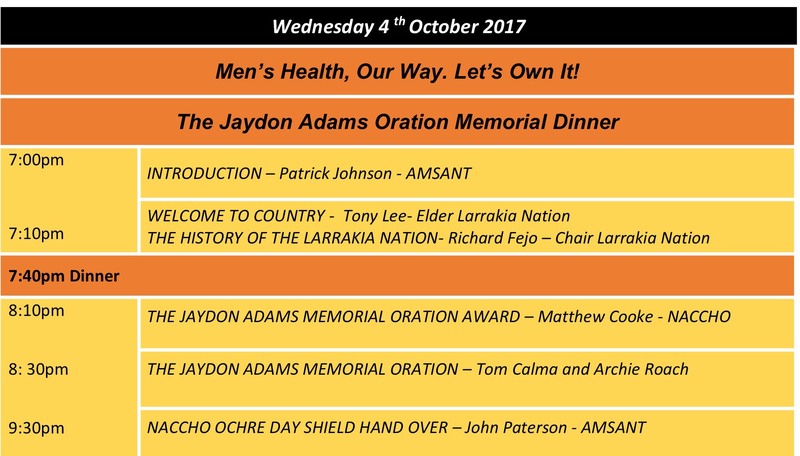 “The awards are testament to the great work being done to improve the health of Territorians and to reduce the likelihood of chronic diseases in our younger generation and generations to come. “Tonight’s function is also a chance to welcome experts and health workers from across the Territory and Australia to Darwin where they will share their knowledge and skills during the two-day conference. The theme of this year’s conference and awards is ‘Promoting Healthy Childhood – Preventing Chronic Conditions’ and focuses on childhood links to chronic diseases.